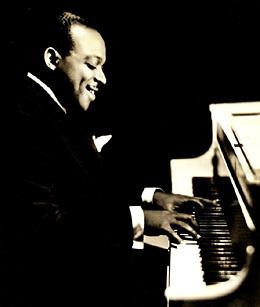 A jazz pianist and bandleader, Count Basie was one of the leading musicians of the Big Band “Swing” era. His Count Basie Orchestra was formed in 1936, and featured singers such as Billie Holliday, and notable musicians including Lester Young, Jo Jones, and Walter Page. The band lasted for many decades, outliving Basie himself. He was born William Allen Basie in Red Bank, New Jersey on August 21, 1904. His mother was his childhood piano teacher, and he was taught to play the cinema organ by Fats Waller. As a young man, he toured with vaudeville acts playing ragtime and stride piano, and after being stranded in Kansas City, Missouri in 1927, played the organ for silent films. He joined the Blue Devils, a jazz band, in 1928. Basie later formed his own group, playing at the renowned Apollo in New York City, New York and in 1937 recorded “One O’Clock Jump” on the Decca label, which became the band’s signature song. The importance of radio exposure in this pre-television era was shown by the heartland enthusiasm for his band’s tours after Basie was broadcast from New York’s 52nd Street Famous Door on the CBS Network in 1938. By the end of the thirties, the band had an international reputation. When Count Basie’s band was hired by a major New York hotel in 1943, it was considered a breakthrough for black musicians, who were often limited to playing in black clubs at that time. When the Big Band era was supplanted by Bebop, Basie reorganized and adapted his orchestra, becoming a popular mainstream jazz band, with successful tours including to Europe and Japan. He continued to record extensively, including with jazz singer Sarah Vaughan and with Frank Sinatra. On March 20, 1981, Carnegie Hall paid tribute to Basie on the 50th anniversary of his career. Toward the end of his life, Basie focused on writing his autobiography, Good Morning Blues, which was published in 1985 after his death. Basie died on April 26, 1984 in Hollywood, Florida. Susan Altman, The Encyclopedia of African-American Heritage (New York: Facts on File, 1997); Charlotte Greig, Icons of Black Music (San Diego, California: Thunder Bay Press, 1999); http://www.pbs.org/kenburns/jazz/home/. California: Thunder Bay Press, 1999); http://www.pbs.org/kenburns/jazz/home/.